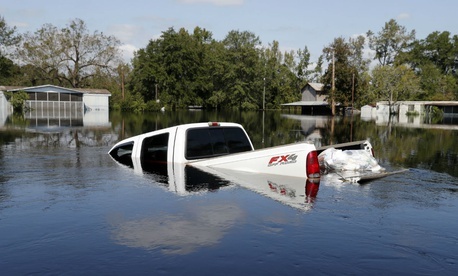 Congress last week voted to overhaul the way the federal government responds to disasters, refocusing more of its efforts on mitigation while allowing affected individuals to benefit from multiple forms of assistance. The Disaster Recovery Reform Act, tucked into a larger legislative package, makes changes to a decades-old law that currently restricts how the Federal Emergency Management Agency—and other agencies with a hand in disaster response—can allocate grants and loans in the wake of hurricanes, wildfires and other catastrophic events. The primary focus of the reforms is to address an issue emergency responders have raised for years: the government generally helps disaster-stricken areas return to their former state as it existed prior to the damage, but does not help them prepare for future incidents. Under the bill, signed into law by President Trump on Friday, disaster areas receiving federal assistance from FEMA will have to set aside some of their funding for mitigation efforts to protect against future events. The president will also be able to authorize federal reimbursement of up to 75 percent of state and local hazard mitigation efforts. Such actions can include elevating existing structures, protecting utilities, making buildings more wind resistant, installing fire-resistant roofing and other steps. Bryan Koon, who until recently served as the director of the Florida Division of Emergency Management, said people in the emergency response community are “particularly excited” about the mitigation piece of the reform bill. The benefits, he said, are multifaceted: focusing on resiliency saves lives and limits damage, gets local economies up and running more quickly and saves taxpayers’ dollars. For every $1 spend on mitigation, he said, the government saves $6 down the road. “It is vital to do everything we can to save lives,” Koon said, “but fortunately that is also the most economically sound thing to do as well.” He added that Congress has focused on ways to reduce the cost of disaster spending—the 2017 hurricane season is considered the costliest ever—and this bill was a significant step toward that end. Another part of the bill will eliminate the “duplication of benefits” restriction, which prevents disaster survivors who receive a loan from the Small Business Administration from receiving assistance from FEMA or the Housing and Urban Development Department. That system left victims with “inadequate assistance,” Koon said. The reforms will “help them get their houses back, help them get their lives back,” Koon explained. He also praised an element of the measure that will give state and local governments more flexibility in administering grants they receive for public assistance and mitigation funding. State and local responders will have more authority to hire people or contract private companies for recovery efforts more quickly. This will reduce FEMA’s role in smaller-scale incidents, Koon said, and allow it to instead focus on truly catastrophic events. “That has been a source of frustration,” said Koon, who now serves as a vice president at IEM. When he left his post in the Florida state government last year, he was still dealing with the fallout from hurricanes in 2004 and 2005. Other significant reforms will seek to expedite the inspection process so money can get out the door more quickly and require a report on the portion of the population without sufficient flood insurance. The reforms were tucked into the Federal Aviation Administration Reauthorization Act, which contained a number of significant changes—and non-changes—related to federal management. The measure included funding for FAA for five years and more notably rejected efforts to privatize air traffic control, as key lawmakers and President Trump had proposed. The measure also reauthorized the Transportation Security Administration, the first legislation of its kind since TSA was created in 2001. It contains a provision requiring managers to form a working group with the American Federation of Government Employees, the union representing TSA workers, to discuss reforms to the agency’s personnel management system. TSA employee representatives have long complained that the workers are exempted from the protections afforded to most federal employees under Title Five of the U.S. Code. Agency management and the union must specifically discuss TSA workers’ inability to appeal adverse actions to the Merit Systems Protection Board. J. David Cox, AFGE’s president, praised the working group’s creation, saying it could help solve longstanding issues at the agency. TSA Administrator David Pekoske applauded the bill’s passage and said it would strengthen the agency. “This legislation emphasizes stability, supports TSA’s outstanding workforce, and modernizes the agency’s structure and operations,” Pekoske said.